As 2018 Approaches, What Keeps Event Execs Awake at Night? In our recent 2018 Event Production Predictions infographic, “pace of growth” took the lead as the #1 item that keeps event executives awake at night. 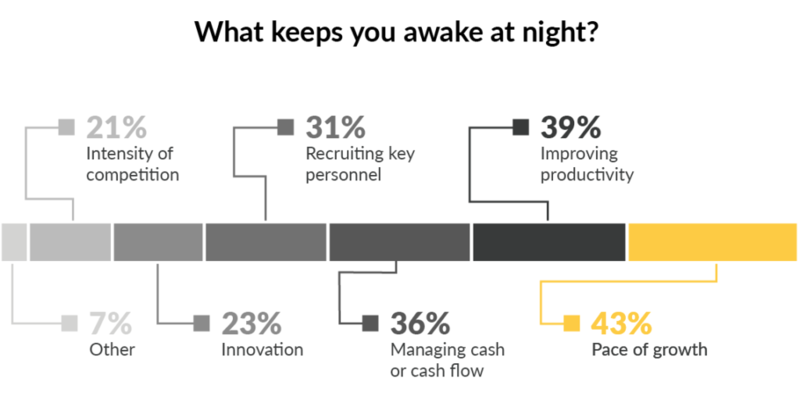 Improving productivity came in as #2 and managing cash flow was #3. It’s no surprise that these are some the things that keep event executives from getting a few extra z’s at night. For now, let’s just take a look at pace of growth. In today’s market, it seems that event production and staffing companies are running from project to project, event to event, with no time to even take a breath in between. This is a great thing, right? Of course… But how can they maintain (and increase!) their growth rate when they are already running on full steam? How can they scale the labor required to grow in line with how fast they are scaling their business? Better and more automated tools for managing labor – from start to finish – are needed to be able to shift focus away from complicated labor management processes and refocus those efforts on business growth. Additionally, the competition for qualified talent is as fierce as ever. And growth is really determined by the quantity and quality of your talent pool. So, in order to get the highest quality talent, event companies today need to offer a better overall crew experience. From making the onboarding processes easier, to having open lines of communication for job opportunities and project details, to ease of payment received – your crews’ experience with your company is now more important than ever. Want to learn how LASSO can support you as you scale your business as well as your talent pool? Request a demo today.